There are several kinds of aggression, and a dog can display a single type or even a combination of aggressive behaviors. They are categorized by what prompts the aggressive display, as well as the circumstances and specifics of the body language. Some kinds of aggression are perfectly normal and harmless once owners understand the context--a growl during play at a toy, for instance, is not necessarily a danger signal. Learn about puppy behaviors and the causes associated with various kinds of aggression, and what you can do to prevent or manage potential problems. In homes with children, there can be some natural sibling rivalry that parents must deal with. 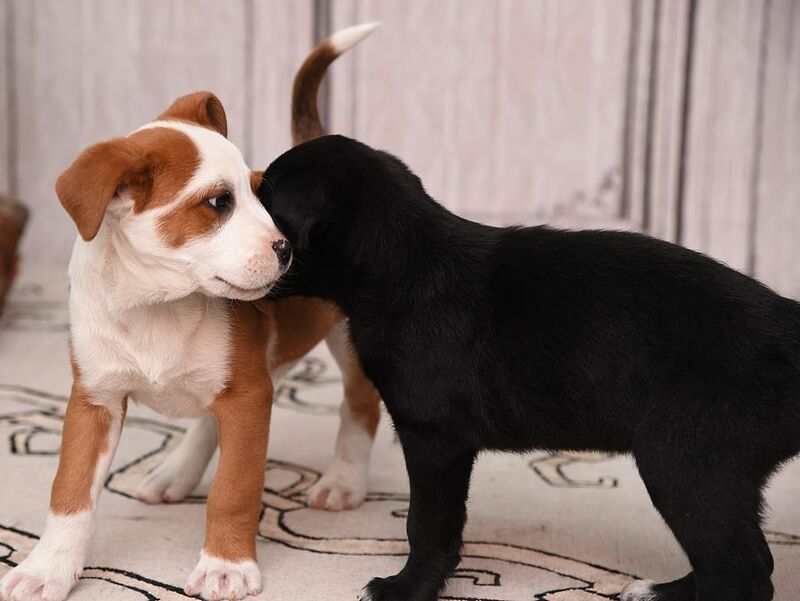 While puppies don't tend to react in quite the same way, you could compare competition for your affection, attention, and resources (toys, food) as a kind of sibling rivalry. Learn the signs and what you can about it. There is a perception that any puppy or dog that acts aggressively is a "bad" dog and that he's "dominant." But more often than not, aggression arises out of fear. The normal response to a perceived threat is to run away--or if that's not possible, to fight. 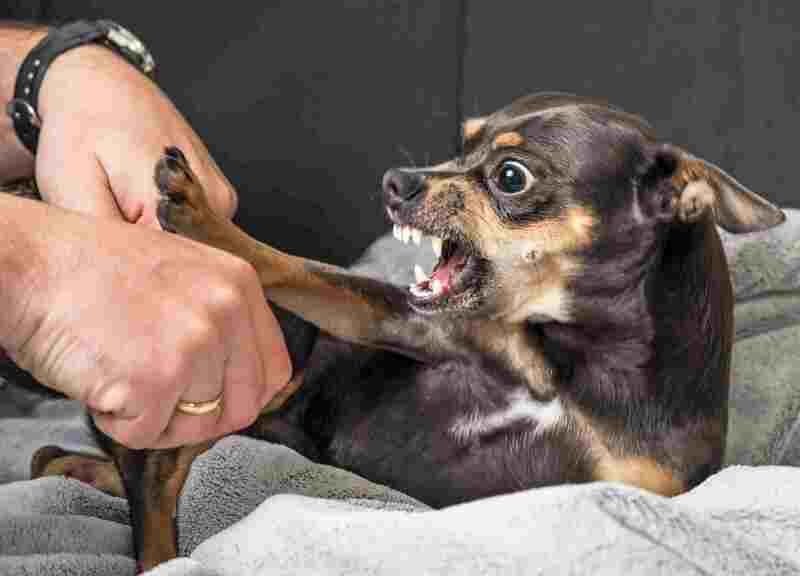 This fight-or-flight response means that fearful dogs and puppies turn to aggression to make the scary situation go away, and when that works, they "learn" very quickly to resort to snarls, growls, and bites. Find out more about what you can do about fear aggression in dogs and puppies. The new, more accurate term for dominance aggression is conflict aggression because puppies and dogs that act this way are anything but dominant. While many dog owners assume aggressive behavior means the dog is dominant, this is only one of many categories of canine aggression. Young dogs that haven't learned how to manage interactions are more likely to display this kind of behavior toward humans, perhaps out of fear--and then when it works, they repeat the behaviors. For instance, the adolescent dog doesn't like having his nails trimmed so he growls and snaps--and the owner backs off, rewarding him for the behavior. Learn more about why dominance aggression develops and how you can prevent and manage the problem. Some pups simply don't like other dogs. Certain breeds like terriers may be more inclined to react with aggression toward other dogs. Walking a puppy that feels fearful or antagonistic toward other dogs may make leash walking a challenge. This article explains why some dogs react with leash aggression and how you can help solve this problem. Learn more in this article about dog-to-dog aggression and leash walking dog aggressive pups. Dogs are territorial creatures, and they want to feel safe in their homes. Puppies often react defensively toward strangers who trespass on what they consider their property--such as your house, the yard, or the car. While we want our dogs to feel protective of our homes, this can get out of hand if the pup decides to "guard" you from your spouse, for instance. It can become a liability issue if protective dogs act aggressively toward neighbors, children, delivery people or others. Read this article to understand what's going on, how to recognize territorial aggression, and what you can do. Puppies and dogs use the very same body language and growl during play as they do for aggression--they just use the signals in a mixed up order, or exaggerate the behavior to show they're "just kidding." Play aggression with puppies that don't know how to inhibit their bite, though, can be painful and scary. And it also can become dangerous if it crosses the line from play into predatory aggression, which can target smaller animals or even babies. Learn what to watch for and how to manage puppy play aggression and predatory aggression. Puppies get excited--and it's fun to watch! Adult dogs get excited, too, and just like with young kids, too much excitement can create poor judgment. Dogs that are normally nice, loving pets as individuals can turn into a "gang" of ill-behaved or even aggressive canines. Multiple dogs increase the excitement factor and the potential for excitement aggression.